Garage doors are available in range of styles and materials that are designed to provide safe, secure and easy access to your garage. Garage doors are made from steel, wood or aluminium. Though each has their individual benefits, steel garage doors are still the most popular choice in the UK. Steel doors wont warp, crack or fall apart due to the effects of weather. And, because most have a polyester finish, they don’t rust or require repainting as often as wooden garage doors. The natural beauty of the wood grain helps enhance the look of a property, especially if your home is a period style. As timber is a natural thermal insulator they are good for retaining heat. 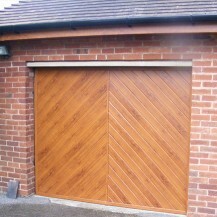 Timber garage doors also have exceptional weather performance providing the utmost protection from the elements. 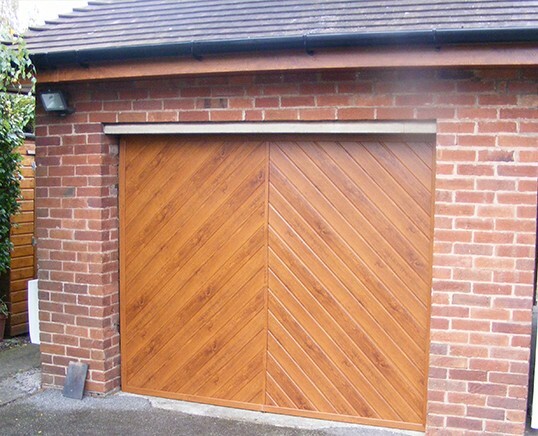 Hardwood garage doors are also available in a choice of wood stains, which includes light oak, red mahogany and rosewood. Roller garage doors are a space saving option that allow you to maximise room both inside and out. Built into a compact coil, roller doors are an ideal solution for homeowners who want to gain extra space and make full use of the driveway. Residential garage doors are available in range of styles so it is important to choose a door that complements your architecture. Sectional garage doors are designed to save space. And rise vertically on tracks, which slot underneath the garage roof. This is an ideal solution for people who want to gain extra space in their garage, or if you need to park your car close to the garage door. Side hinged garage doors are a traditional style that is perfect for frequent use. With two doors that conveniently open outwards, you have quick and easy access whenever you need it. Roller garage doors roll up vertically using an automatic operating system, which gives you effortless room to manoeuvre.